Is a Zip Line Adventure in Hawaii Right for You? I’ve always had what I like to call a “healthy” fear of heights — I don’t experience full-blown panic attacks when faced with a cliff, tall building, or extension ladder. On the other hand, I don’t willingly participate in extreme sports like bungee jumping, cliff diving, or skydiving (although I wholeheartedly admire those who do). However, here’s something I WILL do: Zip lining. For me, zip lining is a fantastic way to experience the thrill of flight without the sensation of falling, which many people (including myself) find disorienting. When I’m zip lining, I feel safe and secure, but also free to act like Tarzan. And, frankly, that can be really fun, too. Those who have a moderate fear of heights will likely feel safe when zip lining in Hawaii. However, those who have a debilitating fear of heights should avoid the activity. How are you with heights? Remember when I mentioned the difference between a “debilitating” fear of heights and a “healthy” fear of heights? If yours is debilitating, and you often find yourself immersed in a panic attack at the very thought of zip lining, don’t try it. Period. How old are you? All zip line tour operators create their own rules and regulations, depending on their course, etc. However, we found that most zip line companies welcome children as young as 5 years old to zip. Participants under age 10 are usually required to have an adult zipping with them, and ages 11-18 are welcome to zip without an adult companion, as long as a responsible adult remains on the property for the duration of the tour. How much do you weigh? I realize this is an intrusive question, but it’s very important to abide by the weight guidelines for safety reasons. Generally-speaking, you need to weigh between 45 and 250 lbs. For safety reasons this is strictly enforced by most tour companies, and all guests are usually weighed at check-in. The harness must be able to fit around your body and be safely secured. So, some companies require that your waist cannot exceed more than 45 inches and your thighs cannot be more than 31 inches in circumference. Not all companies have the same guidelines, so it's important to check with your individual tour operator to make sure you are appropriate to participate. 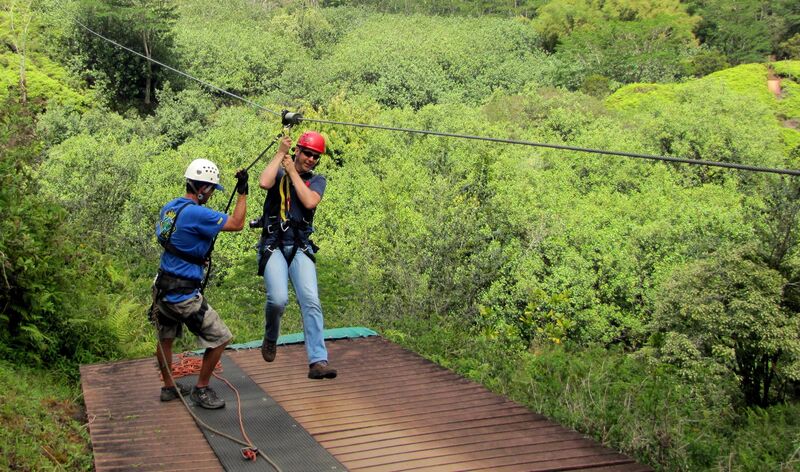 Ready to sign up for a zip line adventure in Hawaii yet? If so, contact Hawaii Aloha Travel and ask about the Kauai Zip Line Adventure, which takes participants through one of the most beautiful landscapes in Hawaii. Zip lining is a safe, fun, thrilling way to see Hawaii’s rainforests — and it’s usually fine for those with a moderate fear of heights, too So, tap-into your inner Tarzan, and zip away!